For use as tie rods or for suspending ceilings, trunking, ducting etc. Long connector nuts available. 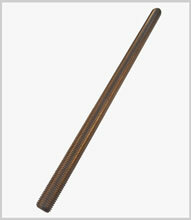 Also known as all thread or threaded bar. They are Available in 1, 2 or 3 metre lengths. Material: Zinc plated steel, also high tensile steel, brass and stainless steel from M3 to M36.